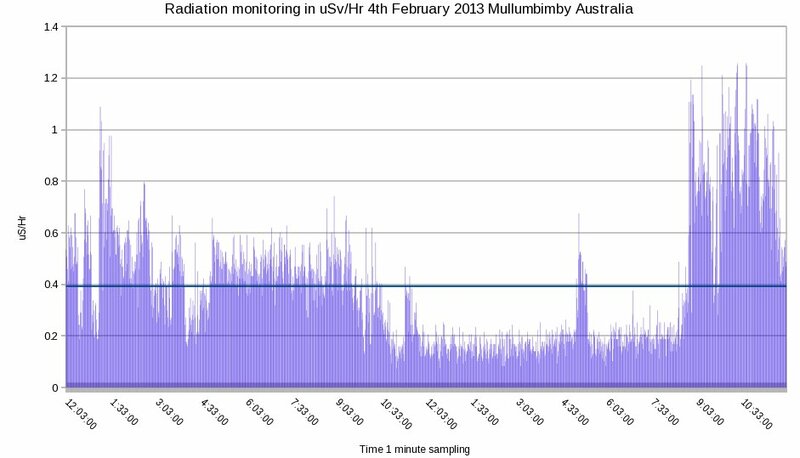 Traces of U-235, and mystery Isotope found in local rain water test, on the Australian east coast. Around 880 grams of activated charcoal was placed in the down pipe from a tin roof, just before the major flooding weather event passed over the area in late January 2013. A reference test chart of the charcoal was made, so it could be compared with the down pipe charcoal capture test. The activated charcoal came from China, and already had some isotope contamination. It was used anyway. After this weather event had passed, the down pipe charcoal was then dried in the Sun. The charts here are a comparison between the reference, and the down pipe test. As you can see, the charcoal filter did capture some significant isotope markers. A lot of water went through this filter to get these results, so in overall terms, they are small detections. I think this proves we are getting fallout, but not as much as we expected. U-238 produces a small amount of gamma at 50 (0.06%) & 114 (0.01%) keV and X-rays at 16 & 12 Kev. U-235 puts out a lot more gamma at 186 (57%), 144 (11%) and 163 (5%) kev and X-rays at 89 and 93 keV. This is probably the reason I was unable to detect U-238 directly at these low levels, when it has such a low gamma output? This brings us back to increasing Radon levels, as the biggest contributor to increasing background levels here. Open to positive suggestions, feedback or corrections, plus any suggestions as to what the isotope or isotopes, might be, at around 492 kev. Interestingly, I also detected this mystery isotope in a soil sample I collected around 15 km west of my location last year. In nature, uranium is found as Uranium-238 99%, Uranium-235 0.72%, and a very small amount of Uranium-234 0.005%. In a nuclear reactor using enriched refined Uranium, the percentage of U-235 is significantly increased. 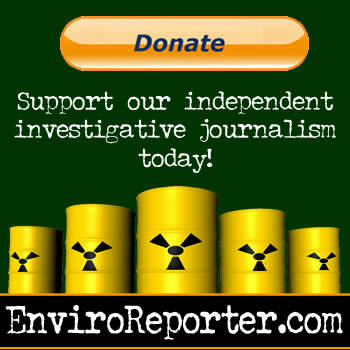 Enriched Uranium in light water reactors has concentrations of around 3% to 5% of U-235. The small amount of U-235 in the rain wash out means there is a lot more U-238 in the atmosphere with it, if it is purified Uranium. 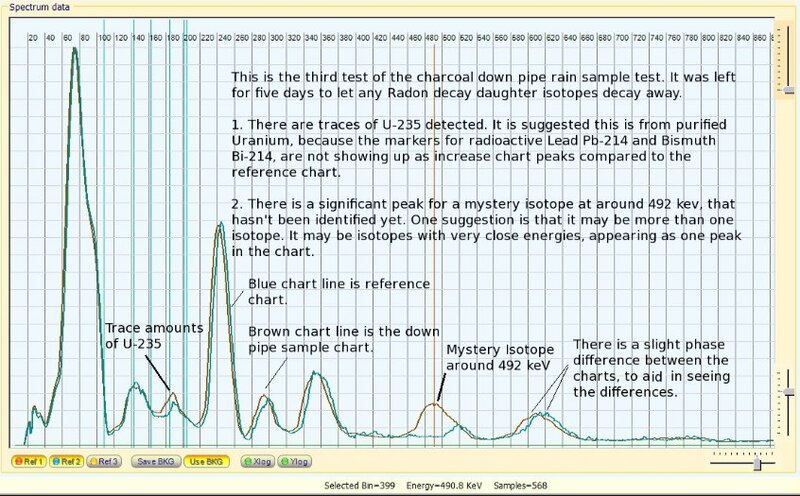 Here is a test chart of Uranium ore, Uraninite. This sample was kindly loaned to me by Spectrometising. This chart has text peak markers to help you. 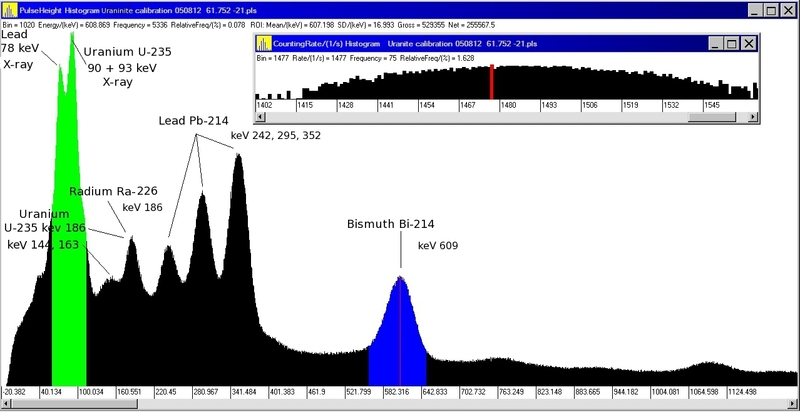 As you can see,if it was Uranium contamination from a mine, you would expect to see significant peaks of radioactive Lead Pb-214 and Bismuth Bi-214 showing up. Alert level Mullumbimby Australia 2nd to 4th January 2013. Mullumbimby in Northern New South Wales Australia, is still getting alert level local background, with day averages at times above 0.40 uSv/hr (50 CPM), plus peaks over 1.20 uSv/hr (150 CPM). Normal background is generally around 0.12 uSv/hr (11 CPM) , see 24 hour charts for the 2nd, 3rd, and 4th of February. 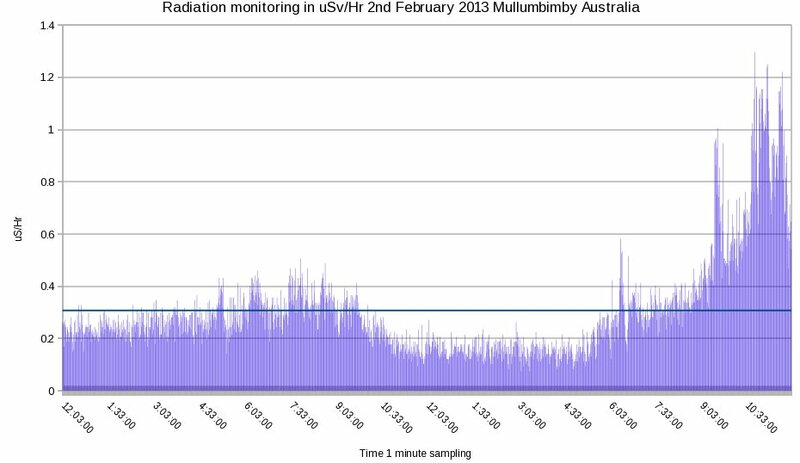 Since the Mullumbimby late January and early February 2013 detection reports were posted, the owner of the Gamma Scout Geiger counter, reported his unit had developed a fault. That fault was investigated, and the unit has since been repaired. He now has a Gamma Scout Geiger Counter, and a Theremino Geiger kit set up with multiple SBM-20 Russian tubes. This means he can now cross check between units, to verify each unit is working correctly. This brings into question the accuracy of the reported detected levels, for late January and early February 2013, at the Mullumbimby location. Yesterday set a day average detection record for this location. It was 0.213 uSv/hr, or 113% above average. The highest day average ever recorded here! This morning I am also getting multiple Geiger counter alarms. It is set to alarm at 0.50 uSv/hr. Spot peak observations and alerts are helpful, but not good enough to fully understand what is happening in your local area. Day average background increases can mean you are cumulatively getting a far bigger radiation dose, than from a short term peak detection would indicate. Since the 16th December 2012, 31 days out of 32 have been 40% above the local background radiation 4 year pre-Fukushima average. See the charts for December 2012 and January 2013, a chart yellow bar means it is 40% + above average, and a green bar is below 40%, meaning levels are average or slightly elevated. A number of new items have been added to “The Food Lab” international food contamination list. There is an increasing number of food items being detected with radioactive contamination from both Japan, and America. To see the latest detections, please visit “The Food Lab” regularly. It is suggested that those of you with Geiger Counters check everything that comes into your house. Imported earrings from the USA, that were to be given as a gift to a friend, were found to have gems embedded in them that tested 0.90 uSv/hr. This is probably not as a result of Fukushima contamination. We are doing more sophisticated tests to find out the source of the radioactive content. I will report those findings in another report. The Free Geiger Counter Guide has just had another update, with a couple suggestions on Geiger Counter kits costing $100, or under. Here is a chart for December 2012, plus this years monthly average chart. This December was 43% above the pre-Fukushima 4 year average for December, making it equal with the month high we had in January 2012. The average for the year of 2012 was 21% above the pre-Fukushima 4 year average, see the month average chart. 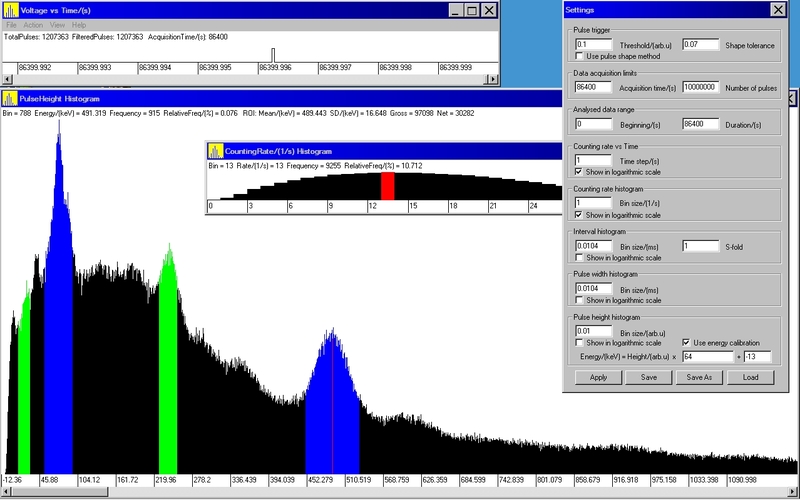 I have incomplete data for December 2011, as the new Gamma Scout Geiger Counter had just arrived. It was a while before I set up data logging on this unit. Didn’t realize how important data logging would be at the time. As you can see from the data I did record for that month, the average for December 2011 was 26% percent above average. Also you can see in that chart, there were more dynamic swings in background levels, compared to December 2012. 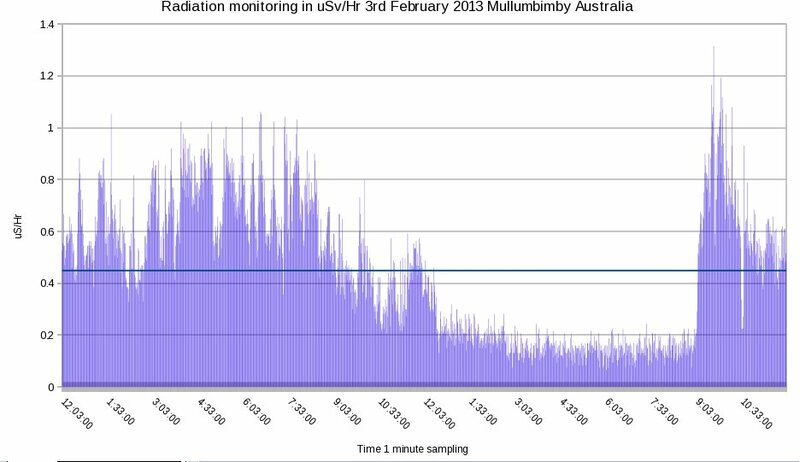 The data is clearly showing increasing background levels of radiation over the last two years, at my location on the central east coast of Australia. Also, during the month there were significant rain washout detections in Caloundra and Nimbin, plus peak detections in Sydney, and on New Zealand North Island.